Lulu Guinness: Be A Pin Up! Just in from the UK ~ Justine just checked out Clerkenwell Design Week! Nostalgia just hit ~ remember those pin art toys from the… 80s? Just lost a little time ending up on searching for the old ones! Found info on it on Wikipedia - random fun fact? “The pinscreen was popularized in the 1985 music video for the Midge Ure song “If I Was”, which included a giant body-sized version.” They are even still available on Amazon! But i digress… this installation from Clerkenwell Design Week is “Be a Pin Up!” from Lulu Guinness, there she is with it above (pics from her blog). 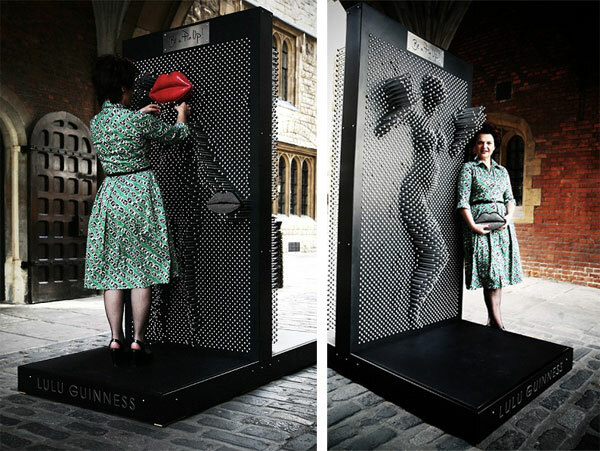 The giant frame of pins is situated in front of the iconic London landmark, St John’s Gate and lets the public create full body sized portraits using the 6,000 chromed capped aluminum pins. Here are a few pics of the images created by passerbys. Check out the pics on the next page! 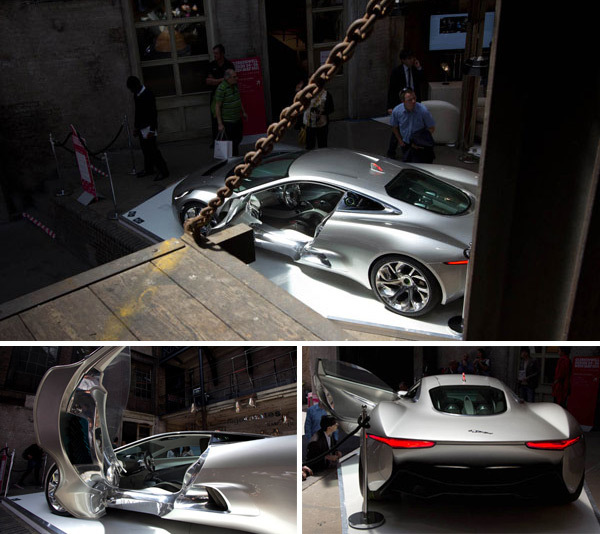 One of the highlights of Clerkenwell Design Week is Jaguar’s C-X75 concept car. Jaguar will produce 250 of the striking hybrid supercars in association with Williams F1. As for design inspiration - “The C-X75’s designers found inspiration in the innovative engineering and functional design elements of cars like the 1950s C-Type and D-Type racers and unique 1966 XJ13 Le Mans prototype.” Additionally it’s leather is sourced from the Scottish Bridge of Weir, one of the most environmentally efficient leather producers in the world… and up to 50% of the C-X75’s structure is made of recycled aluminium! Stunning, right? Especially in contrast to the old industrial, woody setting of the Farmiloe Building that was once home of Victorian lead and glass merchants! Despite how much the display tries pull you in to photograph it, it’s pretty irresistible. But enough talk, more photos after the jump! This simple chart shows the process of studying foreign languages. It explains which languages are too difficult to master, how much time it requires to finish the studies and how many native speakers are in the world. It is common sense that many Romance languages are gauged as “easy,” based on their similarity to English, but I was surprised that Russian is only “medium.” Arabic, Chinese, Japanese, and Korean comprise the list of “hard” languages to learn for native English speakers. "About me" pages have the ability to engage and inform your site visitors in a personal and friendly way. For web professionals, our "About me" page can be critical in establishing a true connection with potential clients, and it can set us apart from a sea of other designers and developers. For different types of websites, keep in mind that the About page could be structured differently. For example, an About page for a blog or news site can be vastly different when compared to the same page for a portfolio website. In this collection, I’ve rounded up 30 excellent "About me" pages from the web portfolios of amazing designers, artists, illustrators, and developers. Enjoy! An interesting use of a cutout/silhouette sets this designer’s About page out from the crowd. A halftone self-portrait and a concise biography of the site owner rounds out this web page’s design. Most designers use a professional headshot photo of themselves on their About pages, but this designer from Sweden presents an interesting and unique perspective with his overhead shot. Bold typography draws you in to create added visual interest. The designer used a grid layout in the layout of his About page. Contemporary colors inform you of the designer’s style, while a status message of his availability to take on new projects makes it clear to prospective clients whether he’s available or not. A unique and effective way of organizing your personal information on the web is to create an online business card (vCard). In doing so, we learn who the designer is, other places to connect with him, and how to get in touch with him. The About page for James A. Reeves is simple and modular, allowing for the large-scale photography in the background. The artistic design of Janis’s website is very captivating. It gives you a glimpse into the designer’s personal aesthetic style, while supplying the information you need to hire him for your next project. The use of large photography can leave a lasting impression on the visitor if done effectively, as shown in this About page. Here’s another example where the designer used a self-portrait in a unique and engaging way. Including a large self-portrait on your site gives a potential client a real person to relate with. Jared Christensen used a humorous, catchy self-portrait on his About page to not only allude to his sense of humor, but also allow the client to see his creative side a little more personally. Jason Reed uses a nice illustration of himself in his About page. The use of an illustration is another way to grab the visitor’s attention and add a more character to your About page. This designer organized his credentials in an easily digestible format. Large photography offsets the information and gives you an idea of the site owner’s style and influences. On this website for a design studio, information is organized efficiently, both giving you an idea of their services while presenting attributes of the designers behind the company. Here’s another striking About page. As you can see, the design is simple, but fun and illustrative. Alexander Dawson (a Six Revisions writer) presents his About page in a very efficient, functional manner. From looking at his credentials, you get a quick overview of who he is, what he does, and the services he excels in. It’s really all you can ask for from an "About me" page, right? Through the use of a grid layout, Adham Dannaway achieves a simple, straightforward About page that also gives you an idea of his skills, illustrated as graphs. The About page for egopop presents a large-scale photo of the designer as well as a simple biographical statement about himself and his history as it relates to his profession. Monkeyworks uses a clean, structured layout on their About page. Not only are the illustrations captivating, but the typography stands out and the graphics used add a nice touch. Great use of typography is what stands out in this "About me" page. Not only does the type make the page easy to read, the grid layout increases readability as well. The designer took their About page to the next level by superimposing their face on Mount Rushmore. Tastefully done, this tactic adds a unique and memorable visual to an otherwise straightforward page. The About page of Joe Payton presents a short bio about him in a beautifully laid out format. The designer also presents information for following him on various social networking sites. The About page of Elliot Jay Stocks is laid out rather simply, but the typography is carefully thought-out and makes you want to explore this designer’s work further. The designer, who is also a speaker and author, presents you with links to pertinent information related to his professional activities. The compelling website for Kitschen Sink made me want to explore the About page. I found out that they’re a jewelry and accessories shop and I learned the history behind the company. Although it’s laid out very simply, captivating branding led me to the About page through curiosity. Matt Mullenweg sets the backdrop for his About page on a highly textured background. These visual layers compelled me to read more about the founder of WordPress. This beautiful About page features animations and depth to draw the visitor in. Clear typography and a monochromatic color scheme set this About page apart. This designer’s About page is really simple and straightforward. It includes a short bio, links to relevant info, and her library. It’s always the neatly designed pages that attract me the most. This beautiful About page of designer Meagan Fisher lets you know all the pertinent information about her and the services she provides. Included are links to social networks and other affiliated websites, all organized into a clean and inviting format. This compelling About page’s character is what draws the visitor in. Inspired by Victorian-era design, the designer implemented old-world style in creating a unique and professional page that serves as an introduction to himself. This unique About page presents a timeline of the site owner’s life — from birth to his projected death. The beautiful watercolor illustrations grabbed my attention on this website. As you can see, his About page is laid out very simply and elegantly. We get a sense of his design influences, on top of his skills and education, through this clean and straightforward approach. Large-scale photography is what sets this "About me" page apart. The page is laid out in a clear format, providing information about the designer and where he can be found. The interaction on this website intrigued me enough to explore its About page. You can see from his short biography what the designer specializes in and how to reach him. Stephanie Hamilton is a freelancer graphic and web designer who runs her own design studio, Stephanie Hamilton Design. You can find her on Twitter @SHamiltonDesign and Linkedin. I guess Google Correlate [googlelabs.com] is a dream come true for any person appreciating statistics and social science (or just likes to explore which line graphs match up). It is Google's newest addition to its already rich and powerful collection of data tools, which already include Google Data Explorer, Google Trends, Google Insights for Search, Google Fusion Tables, Google Visualization API, Google Chart API, or Google Wonder Wheel. The online service allows users to find search query patterns which correspond with those of real-world trends, such as those that correlate with winter time (i.e. 'alpine touring', 'colds' and 'wedding soup'). Alternatively, users can upload their own time series data, and let Google's algorithmic wizardry and computing power let do all the hard work in identifying the search queries that match best over time (e.g. those that match 'visualization' or 'crisis'). In addition, queries can be correlated according to their location according to U.S. states, so that it becomes a statistical fact that the annual geographic distribution of rainfall corresponds to search queries like 'Disney vacation packages', 'mildew remover' or 'pink raincoats'. Oh, and if you really want to know: 'infosthetics' correlates best with 'wikipedia how' and 'tn580', a Brother laser printer. In other words, Google Correlate provides a glimpse in our our crowd-sourced psyche like never before. More information available at the Official Google Blog. Think you live on caffeine? You're still no match for a newly described bitty bacteria called Pseudomonas putida CBB5. These little guys can feast on pure caffeine all day--and presumably all night--long. And researchers have now located just how they accomplish this arguably admirable feat. Celebrated and cursed, caffeine is actually an alluring blend of carbon, hydrogen, nitrogen and oxygen, and the clever bacterium uses specialized enzymes as it "breaks caffeine down into carbon dioxide and ammonia," Ryan Summers, a doctoral researcher in chemical and biochemical engineering at the University of Iowa, said in a prepared statement. There are now 60 million chemicals in the CAS Registry, that’s a number equivalent to 3G users in China, the population of the Roman Empire in 70 BC, the age of the Rocky Mountains in years, the number of casualties in WWII, and the votes cast in American Idol. The last time I mentioned the CAS count was September 2009, when it reached 50 million entries. I remember it reaching the 10 million mark in 1990 (a year or so after I’d started working for the Royal Society of Chemistry, RSC). That seemed like a major achievement given that it had taken CAS 33 years to go from 0 to 10 million. The 60-millionth substance in the CAS registry is a putative antiviral agentt and has the CAS # 1298016-92-8. It was discovered by researchers at the Institute of Materia Medica, in China and is a patent pending derivative of 2-amino-1,3,4-thiadiazine. Capitalism is supposed to produce losses on bad investments. But all too often it has not. In Tokyo this week, corporate executives were outraged when a Japanese government official suggested that banks might have to take losses on loans to the company that produced a nuclear catastrophe. Yukio Edano, the chief cabinet secretary, had the temerity to say “the public will not support” the injection of government money into Tokyo Electric Power, also known as Tepco, unless banks share in the pain. Tepco says it would like to pay compensation to victims, but needs government cash to do so. Consumers like capitalism, not business people. Despite major blowback from a Facebook-funded smear campaign against Google meant to raise questions about Google’s privacy settings, the perception of neither company has been significantly damaged. According to data from social media analytics firm NetBase, which processed data from more than 70,000 news stories, blogs and forum posts, tweets and comments on social networks, the sentiment about both companies changed very little in the aftermath of the news. Negative sentiment about Facebook — particularly mentions that also included Google — rose May 11, the evening the news broke, and peaked the next day. 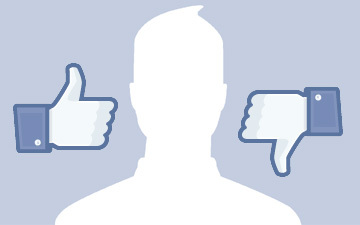 But by May 13, sentiment was largely positive again, and by May 17 sentiment about Facebook had returned to its pre-smear levels even when mentioned with Google. Google, it appears, was hardly affected. Woe to the 24-hour news cycle and our short attention spans, I suppose. You are currently browsing the Ben Shoemate's Notebook blog archives for May, 2011.